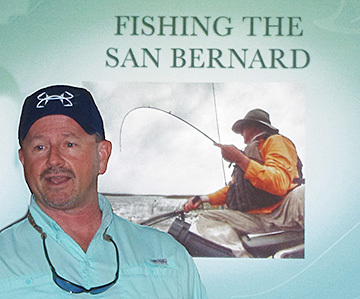 Tom Guffey, local kayak fishing expert, was the main speaker at the “Let’s Talk Fishing” program on Sat Jun 18, 2016 held at the FOR Community Center where he revealed his tactics for successfully catching fish on the San Bernard River. Thirty interested anglers attended the program and heard a myriad of tips and tactics on using weather patterns, water patterns, fishing gear, reading the birds, plus much more to discover where the fish are hiding. Tom stated that with the mouth of the river closed, there is a change in the water pattern but the fish are still there to catch. The San Bernard is a redfish highway and an amazing fishery. He also added that passing barges create artificial tide movement that can be beneficial while fishing. Being the savvy fisherman he is, he did not reveal the location of his favorite honey hole on the river. You will have to find it yourself. Adding to the program was Mike Goodson and Ken Wright who gave presentations from the Friends of the River Ranger program for fifth graders about fish identification of species found in the river and nautical knot/hitch tying. A few attendees found out they were not smarter than a fifth grader. Door prizes were donated by owner Tom Guffey's company IntegriCHEM. This was the second program of a series of programs planned by the FOR Environmental Committee. Watch for information about upcoming events. Speaker Tom Guffey lives in Brazoria and the San Bernard is his "go to" spot. 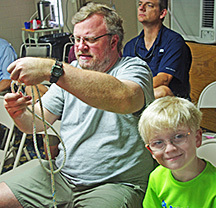 Dad tries to find the “rabbit hole” during the bowline knot tying session. Son smiles as if he’s already mastered it.